As fuel costs continue to soar and governments globally start to get tougher on C02 emissions, the attractiveness of SUVs – even relatively modestly-sized ones like the new VW Tiguan – could soon plummet. Many buyers who choose these vehicles do so not because they regularly need true four-wheel-drive capability. Alternative advantages like higher ground clearance, a perception of greater safety or just the way the vehicle looks are more realistic reasons for purchase. For those people who don’t really need the big and polluting label which increasingly comes as standard with a 4X4, one answer could be to buy one derived from an existing small car platform – and by small I mean European-sized small – think Honda Fit or Ford Fiesta. That’s just what VW is proposing for the platform to underpin the next generation of its small family-sized hatchbacks. VW does very well with indeed with these models in Europe, sold in various guises. There’s the Volkswagen Polo, its sportier Spanish cousin the Seat Ibiza, the good-value Skoda Fabia, the group’s budget entry. In the future, a small Audi – likely to be called A1 – is also on the cards, and seems set to be a premium rival for the highly successful Mini. VW’s latest PQ25 platform will be the basis for this next generation of vehicles. One version has already been previewed in the shape of the next Seat Ibiza, due to be launched at the Madrid Motor Show later this month. Although Seat makes 4X4 variants of its larger Altea, an Ibiza 4X4 is, however, thought to be unlikely. A variant of the next 2009 VW Polo with all-wheel-drive is a much more feasible proposition, and the Audi version could also get the same treatment. Ironically, VW currently makes a small 4X4-lookalike, the reasonably striking CrossPolo (Polo Dune in some markets) which has off-roader styling cues but no capability to back it up. This has caused some commentators to question the reason for the car’s existence, and mock it in road tests. If there is an excuse for the car as it now stands it is best explained as a tough little vehicle equipped to cope with the rough and tumble of city life. VW didn’t invent this look in the small hatchback market – it was pioneered a few years ago by Rover’s Streetwise, and is also currently represented by the Citroën C3 XTR. By combining the undoubtedly rugged looks of these models with proper 4X4 capability, VW could silence the CrossPolo’s detractors and offer something new and worthwhile. Small 4X4s variants of existing cars aren’t new, by any means. One of the earliest exponents was the little Subaru Justy, a pioneering 4X4 from the 1980s which had distinctly ordinary looks but good capability on slippery terrain. In Europe this sold well in rural areas in particular, but it was never in a million years seen as a fashion item. 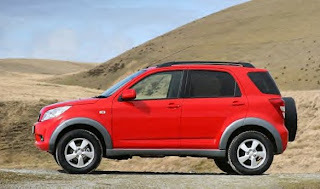 More recently, Fiat has filled a similar niche with its Fiat Panda 4X4. Given VW’s growing acceptance as a force to be reckoned with in 4X4 circles thanks to the big Touareg and medium-sized Tiguan, however, it would be a shame if the company didn’t take the opportunity to build a proper small off-roader in addition to the option of a jacked-up Polo. The truly small 4X4 occupies one of the few uncrowded areas of the new vehicle market, and one which would seem to have a reasonable chance of growing significantly in volume, at least on the European side of the pond. Arguably the only European competitor is the ancient Lada Niva. That aside, two Japanese makers currently sell slightly peculiar entries which would be easily eclipsed by a new purpose-built VW. Suzuki’s 1.3-litre Jimny has real off-road ability but is absurdly small inside and uncomfortable to drive on any but the smallest journey. A better bet and the cream of the current crop is the Terios, from small car specialist Daihatsu, part of the Toyota empire. (The same car is also sold as a Toyota at home in Japan). This boasts four doors and a 1.5-litre engine, so is both more spacious and faster than the little Suzuki. It also looks quite funky. These cars are small and economical enough to drive and park in the city yet also offer the versatility for weeknd trips together with the reassurance of an extra edge should the weather turn unexpectedly nasty. Why other makers have so far neglected this area of the market isn’t entirely clear, but to me it looks like too good an opportunity to miss. I thought that the VW Group had already announced a tiddler 4×4. Skoda have said they are building the Yeti which appears to be based on the Polo platform. That pic definitely IS the Terios – its a clever piece of styling but if you look carefully its actually a lot smaller than the RAV4. I wonder why Toyota doesnt sell it more widely? I also agree that a smaller Tiguan would be great.